LG is out with its new LG Q9 variant. This variant is known as the LG Q9 One that sports a display notch and runs on Android Pie skinned with Android One programme. Other key highlights of the smartphone are, that it is powered by a Qualcomm Snapdragon 835 SoC and comes with water resistant capabilities. The device has a thicker bezel at the bottom and a wide notch at the top, in order to house sensors. At the back, there is a single rear camera setup with LED flash. Also, there is a rear fingerprint sensor in the centre. The smartphone sports a 6.1-inch QHD+ 1,440×3,120 display with an aspect ratio of 19.5:9 and pixel density of 564ppi. As mentioned, the smartphone runs on Android Pie, it is part of Google’s Android One programme and is powered by Qualcomm Snapdragon 835 SoC. The LG Q9 One has a single RAM variant of 4GB coupled with 64GB of onboard storage. With a microSD card, the device can hold up to 2TB of additional storage. The smartphone bears a 16MP sensor at the back and an 8MP sensor on the front. The device packs a 3,000mAh battery with Qualcomm Quick Charge 3 support. Connectivity options include Bluetooth v5.0, NFC, WiFi 802.11, FM Radio and USB Type-C port. The device measures 153.2×71.9×7.9mm and weighs 156 grams. 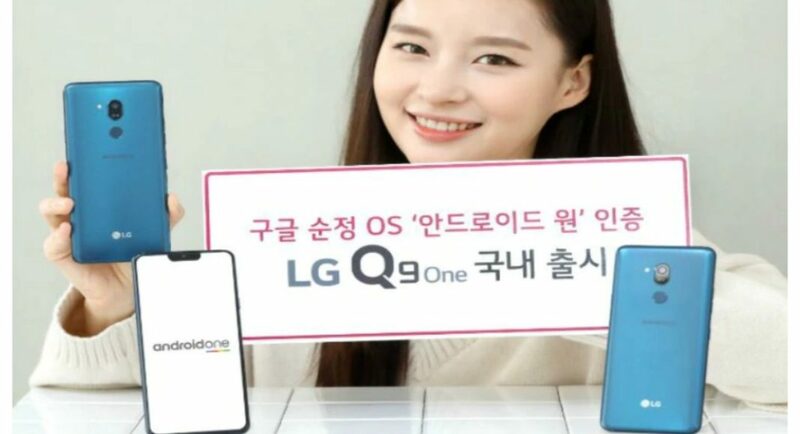 The LG Q9 One is the new variant of the LG Q9 that was launched a month back. To recall, the LG Q9 runs Android 8.1 Oreo and is powered by Qualcomm’s Snapdragon 821 SoC. This smartphone has a 16MP main camera and an 8MP selfie camera. The device has 4GB RAM with 64GB onboard storage. This storage can be expanded via a microSD card slot by up to 512GB. Connectivity options include Wifi 802.11, Bluetooth 5.0, GPS, NFC, FM Radio and USB 3.1. The LG Q9 One is priced at KRW 599,500 that is roughly Rs 37,900. It comes in Moroccan blue colour. The Indian date of launch is still unclear, but by the looks of it can come to India in this quarter.